Stock Prices is the result of demand and supply forces in the capital markets. It is not necessarily linked with financial performance of the company, especially in the biotechnology sector. In fact, a significant amount of the biotech companies being acquired or after raising equity through an IPO (two of the main exit strategies) have negative Net Income. The reason is the huge amounts of capital required to push a product into the market as well as market access and reimbursement issues after the product has been approved. The capital markets and the investors are well aware of these issues and therefore they focus on companies that could bring great returns in the medium to long-term either in the form of dividends (which implies that the company needs to have positive net income) or stock price increase. This article focuses on how a pharmaceutical company can boost its stock price. It should be noted that the suggested means are not definite and there are certain risks and pitfalls when using these methods. Hence, the disadvantages of these methods are also discussed. So how has these companies performed since the stock repurchase programs were announced? The following graphs show the stock price variation since the stock repurchase programs were announced. It can be seen that in all cases there was a minor to major increase in stock price of these companies. However, there are large discrepancies; Pfizer shows a $1 increase in stock price while Biogen has experienced a 4-fold increase in its stock price. This indicates that there are numerous factors affecting the stock price such as M&A, regulatory & legal issues, company expectations and investor expectations. Therefore, one cannot simply draw conclusions from stock fluctuations but it can be, in some cases indicative of the impact of stock repurchase programs. A comprehensive and interesting analysis on this subject has been provided by Life Sci VC. Financial Theory supports that capital structure does not have an effect on firm value; However, in the real world capital markets are largely based on psychology and every move can have an impact. Raising debt can lower the overall risk of the firm provided that the firm has not reached the point of financial distress yet (i.e. the firm is unreliable and unable to pay short-term debts). In addition, depending on the amount of debt raised and how it will be used it may have a positive effect on the stock price. An example is that of Pfizer that raised $13.5 bn. in debt (in the form of corporate bonds) in March 2009 and since then its stock price has been higher than the debt offering announcement. Secured Debt: Backed by a collateral, low interest rate and low risk (e.g. corporate bonds). Unsecured Debt: Partial covenants, medium interest rate and risk (e.g. debenture). Mezzanine Debt: Covenants may exist, high interest rate and risk, convertible to equity. Subordinated Debt: No collateral, very high interest rate and risk. Convertible, cumulative preferred shares with fixed and adjustable dividend rates and voting rights are more likely to attract investors and increase the demand of the preferred stock which may allow the company to further improve the terms of the preferred stock thus leading to an improved enterprise value. This in the long-term may prove beneficial to the common stock as well. Organisation Restructuring requires evaluating, valuing and prioritising the main assets of the company. For example, if your company has multiple business divisions and business units can have “subunits”. 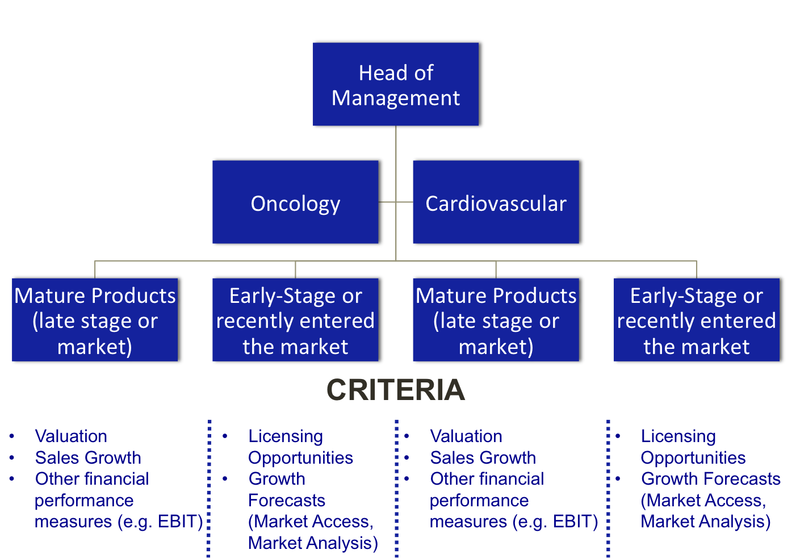 As an example, considering a fully integrated pharmaceutical company which its operations lie on two main therapeutic : oncology and cardiovascular in which they are both split in mature products and early-stage products. Valuing the projects or the business units based on financial performance (e.g. sales growth, EBIT margins) is crucial for the firm (see figure below). If a business unit or a subunit performs well below than the overall performance of the firm then the firm may consider to either raise funds for that unit to organically grow or sell that business to another firm. This will show investors a willingness to grow, improve financial performance that could potentially (in the long-term) be rewarder through a higher demand for equity. It can be seen that the majority of these studies conclude that the effect of M&A on stock return is positive. It should be noted though that due to the fact that most of these studies have used econometric analyses (regression) as their methodology, a large time-series data is required for the effect of time-lags to be smaller in order for the model to show significant results. In other words, small time-lags are used thus implying that these positive effects are short-term while long-term effects of M&A on stock price is not completely visible. If a company is profitable, a certain % or absolute amount of net income is usually reinvested to the company. The rest can be distributed to shareholders as dividends which can have a positive effect on stock price depending on the consistency and the (relative, i.e. compared to previous year) amount of dividends distributed. A portfolio of investments can be optimised by using as a benchmark: (i) average market return, or (ii) 6 month or 1-year average stock return of your company, (iii) Weighted Average Capital Cost (WACC) of your company, or (iv) Industry-specific index average return (e.g. NASDAQ Biotechnology Index – BTK) depending on the (expected) return that a company needs. In order to do that, a historical benchmarking of each type of investment should be performed. The next step is to model different combinations of investments (portfolios) to achieve the required return. Although different combinations may lead to the same required return, adjustments should be made based on the needs and preferences of the company. A sensitivity analysis is crucial as well, as some of the modelled portfolios might be highly sensitive to very few investments which makes the perceived risk high. Overall, diversifying portfolio is a strategy that may be appreciated by capital markets, as the company will show its intention to diversify its risks and returns from different operations. In this article 5 ways to boost your company’s stock price have been suggested: (i) Stock Repurchase, (ii) Raising Debt, (iii) Organisational Restructuring, (iv) Mergers and Acquisitions (M&A) and (v) Diversifying Portfolio. The pros and cons of each strategy have also been discussed. A combination of these strategies is more likely to have an impact on the stock price of your company. For example, a company can go through an organisational restructuring through which a certain amount of capital can be saved. Thereafter, the company can raise debt and use the “saved capital” and some of the debt to perform M&A, repurchase stock and diversify its portfolio, or a combination of the three. For any questions or recommendations do not hesitate to contact me.